This is another great recipe from weight watchers that the whole family can enjoy. 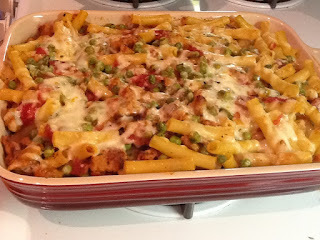 I love baked ziti, and this is the best baked ziti I have ever had. What makes it the best is that it's healthy and delicious! My whole family loved it. You can serve this to little ones ready for finger food (approx 10-12+ months). Position the rack in the center of the oven and preheat the oven to 350°F. Crumble the sausage meat into a large saucepan and brown over medium heat, stirring often, about 4 minutes. Drain off any fat, then add the onion and bell pepper. Cook, stirring often, until softened, about 3 minutes. Stir in the tomatoes, peas, tomato paste, oregano, basil, thyme, fennel seeds, salt and pepper. Bring to a simmer, then reduce the heat and cook uncovered 5 minutes, stirring often. Stir in the cooked pasta and half the cheese. Spread evenly into a 9- X 13-inch baking pan. Top evenly with the remaining cheese. Bake until the cheese has melted and the casserole is bubbling, about 20 minutes. Let stand 10 minutes. Remember to cut everything up into small pieces for your little one. Enjoy! Sounds good and I could freeze it for a future meal.